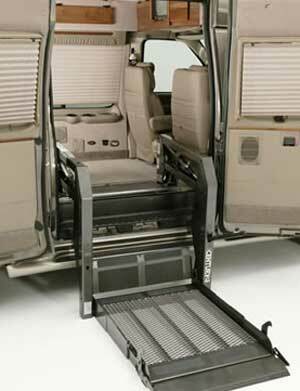 Wheelchair lifts are products that will lift both the mobility device and the person in the mobility device. 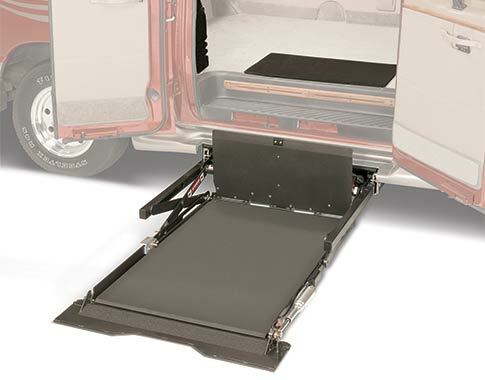 Installed primarily in full size vans, these lifts have a high lifting capacity that will accommodate even the largest wheelchairs. Dual Parallel Arm wheelchair lifts are hydraulic lifts that use a motorized pump to lift and gravity to go down. With many platform sizes these lifts can accommodate different size chairs and people. With a very simple manual back up, they are also very safe. The Vangater 2 wheelchair lift by Braun is an electric lift that offers a unique feature. The platform will fold in on itself allowing an area unencumbered by the lift. This allows you to get in and out of the side doors without deploying the lift. 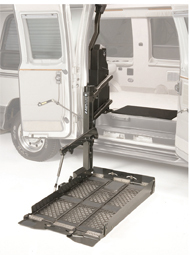 The UVL, or Under Vehicle Lift, by Braun is mounted underneath the van to allow a completely unobstructed door way. Using hydraulic motors this lift has a 750lb capacity.